Wind is the now the cheapest form of electricity generation, with an average price of 89c a kilowatt hour compared to 97c/kWh for Eskom’s new coal-fired power stations. This was said by Roger Price, chief executive officer of Windlab, an international wind energy company that is investing in wind energy in South Africa. “The costs are unlikely to go up because, unlike coal, there are no input costs as wind is free,” Price said. When comparing the prices of electricity generation for wind and coal, one had to compare the price of electricity generation by new power stations, not that by those whose construction costs were paid off decades ago. This would mean comparing wind power with Eskom’s new Medupi and Kusile coal-fired power stations. “Eskom said to Parliament that electricity from Medupi and Kusile would be 97c/kWh,” Price said. “The University of Pretoria did a study which says it could be 120c/kWh. 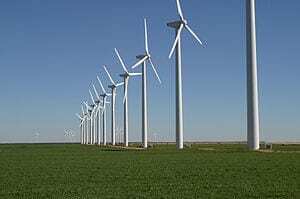 “In the second round of bids for wind energy the average price was 89c/kWh. Of the 16 percent annual price increases that Eskom has asked for over the next five years, three percent would go to support independent power producers in the renewable energy sector, which would provide 10 percent of the generation capacity. Price said a persistent myth about wind power was that it could not be used for baseload electricity generation because the wind did not blow all the time. “The Council for Scientific and Industrial Research’s wind atlas shows that South Africa has fantastic wind resources, one of the top five countries in the world. The way it would work would be to have a network of wind turbines in different areas across the country, and when the wind was not blowing in one area it would be blowing in others. Wind would be part of the electricity mix.